Find hotel near Museum Of Greek Gastronom .. Recently opened in 2014, the museum of Greek Gastronomy invites the visitors to experience an educational and vivid sensory experience of the Greek cuisine. Conceptualized and established by four young Athenians, founder KonstandinosMastourdelis, AlkioniMatsourdeli, Lydia Damkarelou, and Omiros Tsapalos, this museum seeks to highlight the special historical and cultural elements of Greek gastronomy. 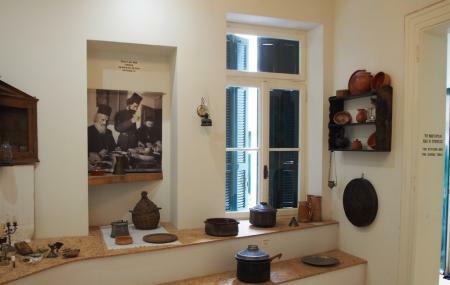 Inside the museum, the visitors shall come across some permanent exhibitions unravelling the processes involved behind popular products such as olive oil. Moreover, there are temporary displays that deal with specific subjects related to culinary preparations. For those who wish to take some ingredients back home, there is a museum shop on the ground floor, and a courtyard cafe. You can also participate in cooking sessions here. How popular is Museum Of Greek Gastronomy? People normally club together Aristotle's Lyceum and Monument Of Philopappos while planning their visit to Museum Of Greek Gastronomy. Excellent classic greek food at reasonable prices. The restaurant is situated in a romantic backyard. The young team does everything to make you feel welcome. They are also very knowledgable about greek cuisine. They give free and very interesting tours through the museum. During the day you can also drink coffee here. We recommend this place very highly and if we come back to Athens will definitely visit it again. Great setting for a glass of wine in a beautifully restored old townhouse. A must visit!